You can choose what you would like to see! Old Panama Ruins (city founded in 1519). Panamá Viejo was sacked by Pirate Henry Morgan in 1671. The city burnt, but ruins are being reinforced and the main cathedral is being rebuilt. Casco Viejo – Henry Morgan sacked old Panama. This area has been declared World Heritage by UNESCO, so whatever renovations are done here, it has to be done in the original French colonial facade. The Amador Causeway – U.S. man-made road built with material that was removed when the Panama Canal was constructed. With water on both sides, there are a lot of wonderful restaurants in this area and a beautiful view of the Panama City skyline. You can see the Pacific entrance to the Panama Canal and the Amador Causeway is also where you can visit our new Frank Gehry’s Museum of Biodiversity. 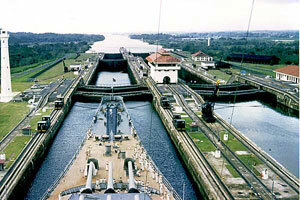 Miraflores Locks – You HAVE to see a ship transiting the locks so close that you feel you could almost touch it! We have a beautiful center with an unbelievable museum, where you can see a ship passing through Miraflores Locks right in front of you. There is also a very good restaurant here where you can eat lunch or dinner while looking at the ships transiting through the Miraflores Locks. American Bases (Albrook/Clayton), where all the military used to live until December 31, 1999. I will also show you some of the areas where civilians who worked on the Panamá canal used to live. Gamboa Rainforest Resort – There is a gorgeous hotel in the middle of the rainforest called the Gamboa Rainforest Resort, it is about a 45 minute drive from Panama City is beautiful….about 25 minutes from the Miraflores Locks. The drive is beautiful….and the view from the hotel overlooking the Chagres River, the Gatun Lake, and the Rainforest is amazing. This area is known as a birder’s paradise. In Panama, we have more species of birds than Canada and the United States together! Metropolitan National Park is the only protected area in Central America that exists within the borders of a metropolitan city. The park covers 265 hectares and we can go on some trails that lead through the rich vegetation of vines, bindweed, shrubs, orchids and trees, in addition, a variety of species of mammals, reptiles, insects and birds. The park is about 20 minutes away from any of the local hotels in Panamá City. Shopping….we will take you to a place where you can find all the Indian handicrafts…..we have seven different ethnic groups in Panama and each group has their own handicraft. 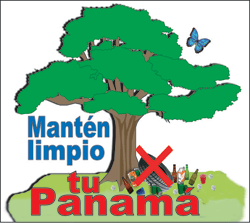 We will show you the different neighborhoods of Panama City. This tour is just for you to get a feeling of our city, and know what the different neighborhoods look like. This will also show you which neighborhoods are closer to hospitals/hotels/casinos/restaurants, etc. We will take you and we will visit a supermarket so that you can see how modern and well stocked they are. or Albrook Airport in Panama City, Panama? Instead of sitting at the airport, let Easy Travel Panama show you some of the primary historical/cultural attractions in Panama City, such as the Panama Canal, the ruins of Old Panama, the beautiful Casco Antiguo that is being renovated in the original French/Colonial style, the Amador Causeway where you can see an amazing view of the skyline of Panama City. Let us help you get the most out of the layover time you have in Panama! From the minute you touch Panamanian soil our knowledgeable drivers and guides will receive and assist you. We offer transportation and tours throughout Panama City and other nearby popular destinations. Our drivers/guides are knowledgeable about all aspects of Panama and its diverse cultures. We can customize sight-seeing, cultural, historical, nature tours, Embera Indian Village tours, or shopping excursions based on your individual needs and particular interests. Our bilingual drivers/guides, although very professional, are a lot of fun and very experienced working with international guests. We have hundreds of totally satisfied clients and we are confident you will feel the same. 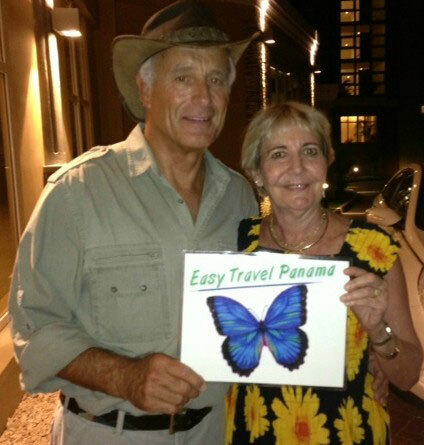 Easy Travel Panama provides personalized ground transportation and touring services for 1 person or whatever size group you are traveling with.From 1 to 3 persons transportation would be in a comfortable car. More than 4 persons we have different size buses. If you are taking a cruise..and your cruise stops for a day in Panama. It could stop either at the Colon Port (on the Atlantic side)..or at the Amador Port (on the Pacific side). We can pick you up at either port and organize a personalized tour just for you. We specialize in personalized City/Cultural/Historical/Panama Canal tours, Shopping tours, Recognition tours, etc. All of Easy Travel Panama drivers and guides are fully bilingual, very knowledgeable of our history and culture, professional, and at the same time a lot of fun! We have hundreds of totally satisfied customers and we know you will feel the same.